What is dispute systems design? 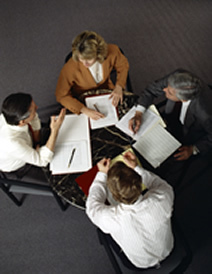 Dispute systems design is the process of developing an effective way to manage an organization’s conflict. CMP works with the company to evaluate its present manner of managing conflict and then applies essential elements to create a more effective system. Additionally, CMP assists in refining the system through monitoring and feedback and is available for future onsite support. Why should an organization have a formal dispute systems design? Disputes are inevitable in all aspects of life, including within an organizational environment. A formal DSD is used to resolve internal conflict. The system is a cost effective process to help disputants resolve issues in a timely manner with a lower level of frustration and emotion. An effective DSD has the potential to protect and maintain existing working relationships, and the inner workings of the business need not end up as public record. Changes inside the company resulting from following the system generally have far-reaching positive effects on the morale of the employees and the business as a whole. In the case of external conflict, an effective DSD incorporates methods to prevent and lessen disputes with outside entities. The system can, thus, assist in building and maintaining good relationships with clients, other companies and the public and avoid the expense and time of litigation, unhappy customers and lost business. Once a dispute systems design is in place, how quickly will it help resolve disputes? Resolution of disputes can occur as soon as a new system is in place. Upon implementation of a new dispute systems design, CMP facilitates each step and works with the organization to ensure the system is operating satisfactorily. CMP continues to refine the system as necessary and is available for future support. How does a dispute systems design reduce costs of conflict? Reduce the amount of time, energy and expense associated with prolonged conflict and damaged relationships. Create a better opportunity for the parties to get interests met. Improve, strengthen and preserve relationships. Generate more options for effective and durable resolutions.